My mission recently has been to discover the perfect pink blush. I struck gold with "Ripe Peach" blush ombre in the peach sector and now all my focus has been on different shades and textures of pink. Here's 5 to lust over..
Mac Dollymix (Sheertone shimmer) on the right. Both of these have been compared to each other as Tippy was limited edition with the Hello Kitty collection, however as you can see, Tippy is more cool toned as opposed to Dollymix which is more warm toned and Rosy. Dollymix is also sheerer than Tippy but still pigmented. This is a cool toned medium pink with finely milled silver sparkles. MAC Well Dressed (Satin) on the right. Both of these blush colours look quite similar in tone, but Well dressed is slightly darker, it's a satin so it has a soft sheen with no glitter. However, Moon River is very glittery which I use it as a highlight, I can see it working as a blush for fairer skins. Here are the swatches for comparison! To be honest I NEVER wear Tippy, it's far too pigmented on me and it just looks way too much. I do think however it will get some use when I am uber tanned. Dollymix doesn't look that special in the pot but when applied looks beautiful. It has a soft sheen and applies really pigmented but still manages to look natural, I would however recommend a light hand. Well Dressed is a perfect blush for those who don't like to wear blush. Even though I love blush I do tend to skip it in my routine sometimes. When I wear this I don't feel like I need a highlighter as the soft sheen adds a nice glow. Moon River is a sparkly icy pale pink, it's probably the most used powder blush in my collection. I tend to use the lighter side as a highlighter, and the darker side as a blush when I want my cheeks to glow, it will look really pretty and stand out more on fairer tones of skin. I love Well Dressed for everyday, Dollymix is for when I want the perfect pink cheeks and Moon River is my perfect pink toned highlighter that doubles as a blush. Sadly Angelika and Tippy don't get a lot of love. What's your favourite pink blush? Angelika looks really pretty on you! I can't believe your don't wear it more often. I may have to check it out. I am not a blush person per se either, but wow, can it make a difference, right? Well Dressed looks amazing! I've heard so many good things about it. Recently I've been on the hunt for the "perfect dusty rose" blush. 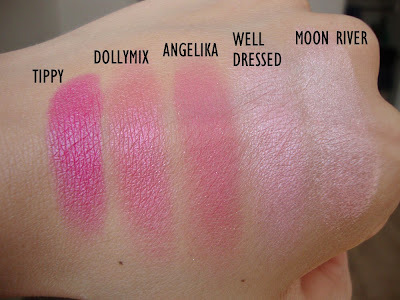 i love dolly mix -so far its my fav pink blush!! For me it has to be Dainty but I always go for the pink/peach/gold ones. My favourite being Style!!! I love clinique blushes for their very light application, since I don't have the guts to wear a strong blusher. But I'm really dying to try a Grand Duo Blush for a party or evening look. Angelika seems so pretty and perhaps the most wearable for me. I agee tippy looks way too pigmented. well then i'm going to need to pick up dollymix and welld ressed! I totally hear you on Tippy - even though I'm NC40 even when Iapply it with a light hand or whatever it still looks a bit much, so I don't get that much use out of it! I love Proof Sheet by Smashbox which is a lovely, matte soft pink; a bright fuschia also by Smashbox called Radiance. And Avon had a great one - Cynthia Rowley for Avon all over face powder - still have it and it gives that natural flushed look to the cheeks. I'm trying to promote it so I'll be very excited to get more visitors. Have a good day all! I love Dollymix. My other favorite pink blush is Pink Swoon. Yay for great pink blushes! those are all beeautiful colours. i love blushes! I absolutely love when you do posts like these! Dollymix looks gorgeous! I've nebver bothered looking at it before but I may as well now :) I'm a complete blush freak, my latest love is Becca Gypsy, absolutely beautiful. I love well dressed its perfect for every day natural looking make up. My favourite pink drugstore blush is by natural collection (boots) in the shade pink cloud, its a pretty mid tone pink with no glitter, you should try it as its around £2 only! I relly like the swatch of TIPPY! But my fav is Dolly Mix! Love it! I went to try well dressed and dollymix once but the MUA thought that blushbaby was a better choice for me. Recently rediscovered dandelion at the bottom of my draw from benefit, very pretty! Barry M's Orchid Blush is surprisingly good - very pigmented and stays on allllllllllllllll day!